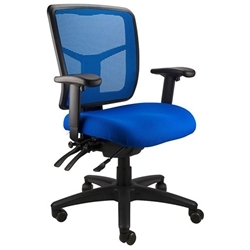 Features: 3 Lever fully Ergonomic action with Sliding seat and Rachet back height adjustment. Standard with 5 way Black Nylon base. Adjustable arms and Polished 5 way Spider Base are optional extras. Colours: Black, Red, Orange, Blue, Green and Grey. Gas Height Adjustment: 475mm to 600mm.